Every hospital and healthcare provider has to wash a wide range of items including dishes, clothes, fabrics and medical instruments and many more. Miele Professional washers, dryers, dishwashers, and thermal-disinfectors offer outstanding cleaning in healthcare kitchens, laundries, consulting rooms, and laboratories. Everyday cleaning becomes easy - and clinically clean results become assured. Miele means peace of mind, with a range offering validated cleaning and process documentation. Miele means accreditation to stringent criteria, like EN ISO 15883, and the new CfPP 01-04 health care guidelines. Miele means innovation, and Miele means durability, too. Our machines work for years, backed by class-leading service. Hygienically clean? It has to be Miele Professional. Thermal Disinfection cycles in Miele Professional Dishwashers meet with Department of Health guidelines for dishwashing in the care sector. When healthcare providers clean dishware, they need more than a washing up bowl. Hospital acquired infections affect thousands of patients each year - and the Department of Health (DH) has set tough guidelines, to help stamp out the problem. Thankfully, Miele Professional has just the solution. And with typical Miele ingenuity, it works faultlessly in every way: dish washing rigorously, quickly, and economically. Miele knows that ordinary domestic dishwashers don't stand up to the problem. They're just not hot enough, for long enough. Or work with sterilising chemicals. Commercial tank dishwashers balk at the challenge, too. Lacking a freshwater system, their low temperatures cannot guarantee to inactivate dangerous pathogens. The G 7859 TD dishwasher is designed specifically for healthcare and fits perfectly into hospital wards and kitchens, childcare centres, and care homes. The G 7859 TD disinfects at a default 85ºC - exceeding DH/Department of Health minimum standards, right from the start. There are three disinfection programmes, and freshwater dishwashing means clean water, every wash. 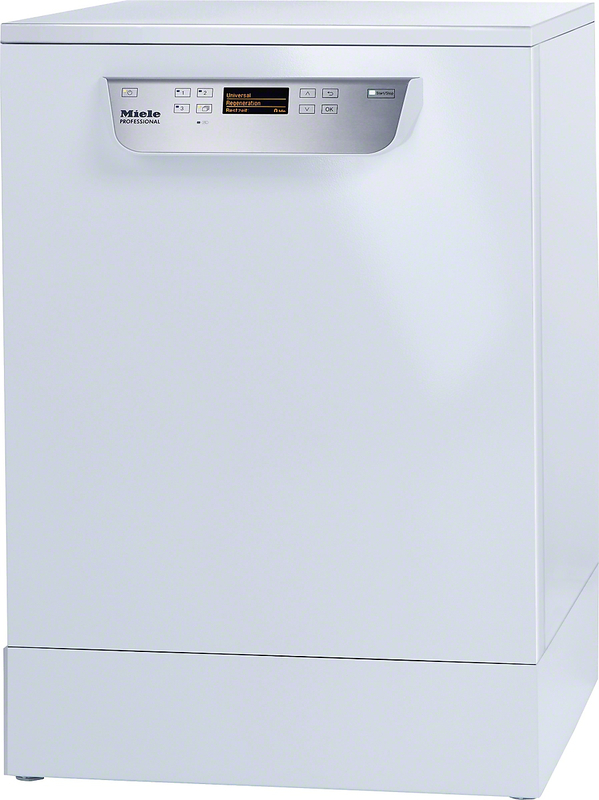 The dishwasher's Multitronic Novo Vario controls are easy to understand and use. The benefits? Healthcare dishwashers built to German standards, surpassing Department of Health requirements and with Category 5 approval from WRAS, the Water Research Advisory Scheme. In other words: healthcare tough. The Department of Health recently introduced new guidelines, CfPP 01-04, to replace the previous HSG (95) 18 regulations. Read more about them and how to make sure that your organisation complies. Need to improve patient safety, clinical effectiveness and patient experience. The Department of Health have recently issued new guidelines called 'Choice Framework for local Policy and Procedures (CFPP) 01-01. Management and decontamination of surgical instruments (medical devices) used in acute care': The new comprehensive guidelines have been generated to help drive the continuous need for improvement of patient safety, clinical effectiveness and patient experience in the medical field. But what does that mean for you? Well, in order to comply with government regulations, you'll now need to ahdere to the essential quality requirements mentioned in the CfPP 01-01 guide. Miele Professional washer disinfectors comply with the new guidelines and ensure service-users remain safe and in no threat from infection or contamination. Need to improve patient safety, clinical effectiveness and patient experience. The Department of Health have recently issued new guidelines called 'Choice Framework for local Policy and Procedures (CFPP) 01-01.